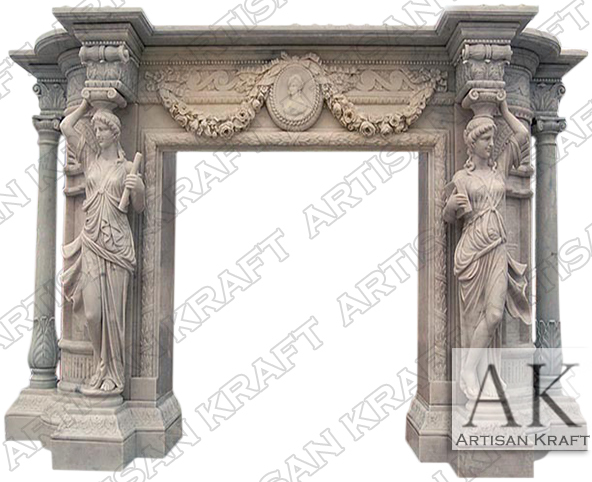 The hand crafted Greco Roman Fireplace Mantel is carved from solid marble. An archetype Italian Fireplace. This mantel is a solid representation of the architecture that is seen throughout Italy. The historic columns and marble statues with scrolls and wreathes. A large design that is fitting for a grand room or lobby. This very decorative surround has both columns and statues. Scrolls a top the columns and in the hands of the carved sculptures. Leaves and a medallion make this a unique mantel. The shelf makes this large facing even more decorative. A unique feature for a very special mansion. Call for more information. Pricing will vary depending on the size and the stone that is selected. Please email our Los Angeles office or visit the Chicago showroom to view similar designs. Showroom will be opening in Los Angeles and New York soon.